One of the latest seasonal offerings that Sonic is providing are “Boneless Wings” in three flavors: Buffalo, Asian Sweet Chili, and Barbecue. The rationality of eating sticky wings in a car aside, we thought these wings sounded like they could either be amazing or awful, so we figured we’d put them to the test. We ordered a 12-piece, which appears to be the smallest size offered for splitting it into two flavors (which is odd, since the 6-piece is divisible by 2). Ordering Buffalo and Asian Sweet Chili seemed like the reasonable choice, since Barbecue is also a default sauce packet flavor. The chicken flavors came in two separate containers (the long flat ones, which have occasionally been referred to by customers as ‘troughs’, amusingly enough). 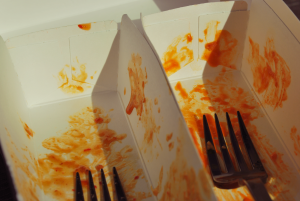 The sauce had gotten cold surprisingly fast, even in the several layers of bags and boxes they had packaged our food in. It was warm for an autumn day, so this was mildly disappointing. The Buffalo is tangy and sour in a way that’s reminiscent of Domino’s hot chicken wings. We hesitated to describe it as buffalo sauce, as it lacked complexity and buttery flavor. There’s no real resemblance to restaurant-style hot wings, more like the prepackaged microwave kind. The Asian Sweet Chili is very, very heavy on the sticky sugary flavor. The sauce is a thick glaze, and is vaguely smokey with a barely-detectable ginger burn. The smell and first taste suggested hoisin sauce, but the next few bites tasted more like barbecue sauce. There’s red pepper flakes floating in the sauce, completely unidentifiable and adding virtually no flavor. As for the chicken itself, it’s generic white meat nuggets with the same flavor and consistency as their pre-existing Jumbo Popcorn Chicken menu item (for some reason, the Asian Sweet Chili was a little more crunchy than the Buffalo). 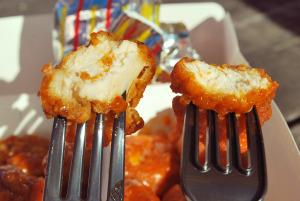 The tenders are large and satisfying, good to eat in two bites and make one big mouthful when popped in whole. Overall, it was better than the Mighty Wings McDonald’s had put out last year, but it’s still drive-thru hot wings, so that’s not saying too much. Fast food restaurants seem keen to come back to hot wings as a gimmick, but it never really works. 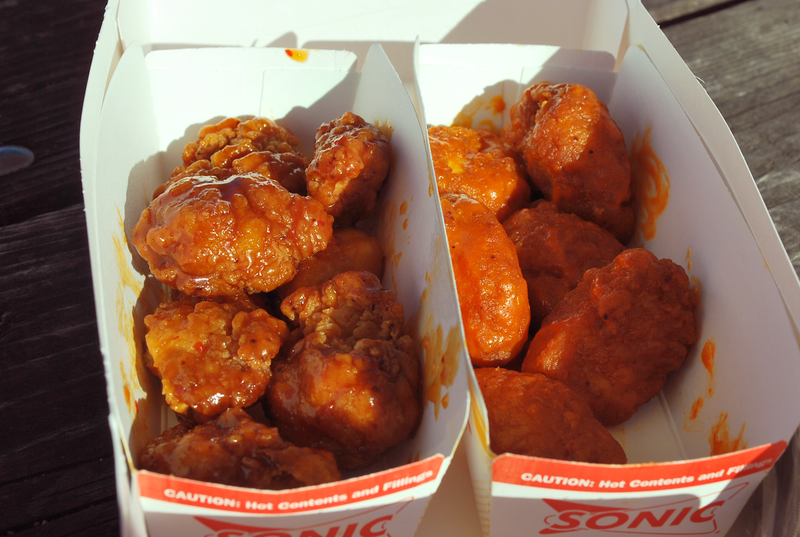 Sonic made the right choice by making these wings boneless, but the price and the flavor still left a lot to be desired.